Throughout the history of warfare, fire has always been used as a weapon to put fear into the hearts of men. During the early 1900s, flame-throwing weapons were developed, and almost as soon as automobiles were invented, methods of attaching these weapons to them were explored. 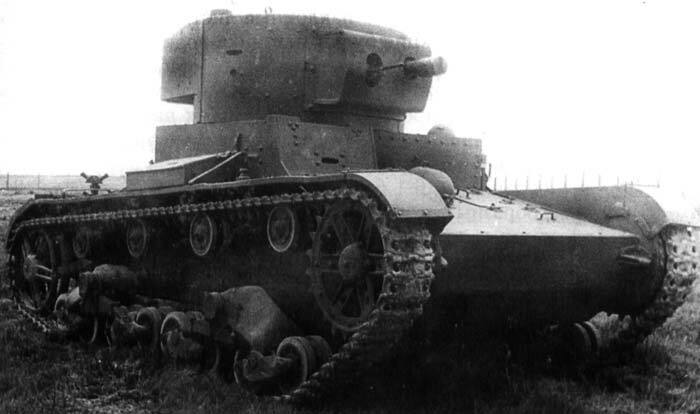 In the early 1930s, the Soviet Union was interested in equipping a standard T-26 tank with a flame unit. These tanks were produced in their thousands and became much feared weapons. 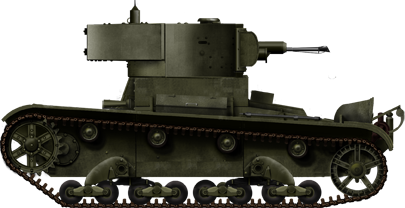 From the beginning of T-26 production, methods of converting them into support vehicles were explored, and one of the most favorable redesigns was that of a flame-throwing tank. Russian interest in flame throwing tanks began as early as 1914. However, due to technological restraints, this could not be followed. During the interwar years, the opportunity arose again to explore the possibility of flame-throwing tanks. In 1931, the T-26 tank was chosen as the basis for this new design. The Bolshevik plant, later renamed Factory 174, was ordered to develop a compressor system for a “chemical” weapon. It was decided to call this vehicle the BCM-3. However, the simpler name of HT-26 was more frequently used. A pre-production HT-26. Notice that the KS-24 flamethrower was attached to where the ball mounted DT-29 was usually situated. These tanks have been called a variety of things, from KhT-26 to OT-26. HT-26 is the proper name, as the Russian word for chemical (химическая) begins with an “H”. However, OT-26 could also be correct, as the Russian word for flamethrower (огнемет) begins with an “O”. 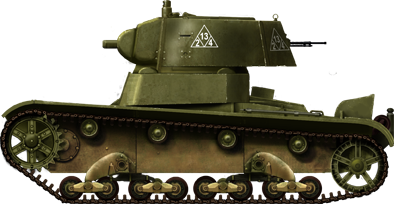 The “chemical” T-26 was designed by engineer G.E.Shmidtom, using the hull of a twin-turreted T-26. The left turret was completely removed, and a container was placed below its position, with a capacity of 400 liters, along with three 13.5L cylinders with compressed air, a high-pressure manifold, gearbox and a diffuser. The right-hand turret was retained, and a KS-24 flamethrower was installed into the cheek of the turret, just before the gun mantlet. Due to the risk of damaging and knotting the flexible hose inside the tank’s turret, it could only traverse 270 degrees. At the rear of the tank, there was a combat refueling port with an armored cover. Often not discussed is the fact that the flame-throwing tanks could also carry other materials, hence the name “Chemical” tanks, rather than “Flame-Throwing” tanks. Chemicals to discharge smoke, or other toxic materials could be carried and interestingly cleaning equipment could be mounted for decontamination. Even water could be carried in the canister for basic decontamination tasks. One of the initial production HT-26 tanks. Notice that the flame unit is placed in the cheek of the turret. A large armored plug with a refueling cap is situated where the left-hand turret was. The prototype HT-26 was tested from June 1st to July 15th, 1932 at the Scientific Chemical test range, and was received well. It was found that the maximum range of the flame was 35 m, and short bursts of 5 seconds produced the highest efficiency rate. The HT-26 entered production shortly thereafter, and between 552 and 615 vehicles were manufactured. However, a new turret was actually designed for these production tanks, along with alterations to the hull. 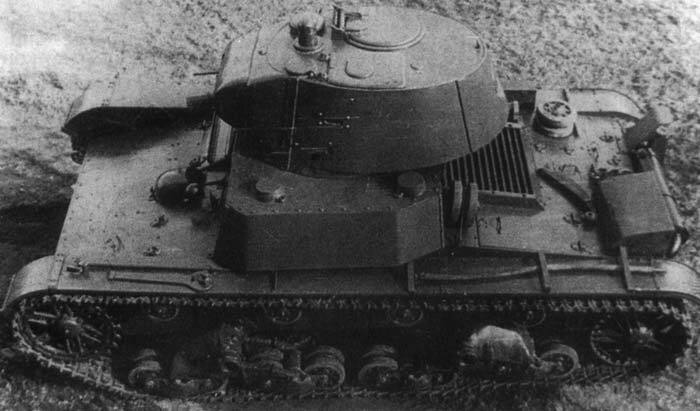 The original T-26 turret’s mantlet was widened to be as wide as the turret. The flamethrower muzzle was attached to the mantlet by a ball mount. A DT-29 7.62 mm (3 in) machine gun was placed to its right. The hull originally had a large armored cap in order to cover the hole from the removed left turret. This was replaced in production tanks with a single plate, with two hatches for refueling the tanks. As T-26 production continued, avenues into improving the support vehicles of the Red Army were explored. 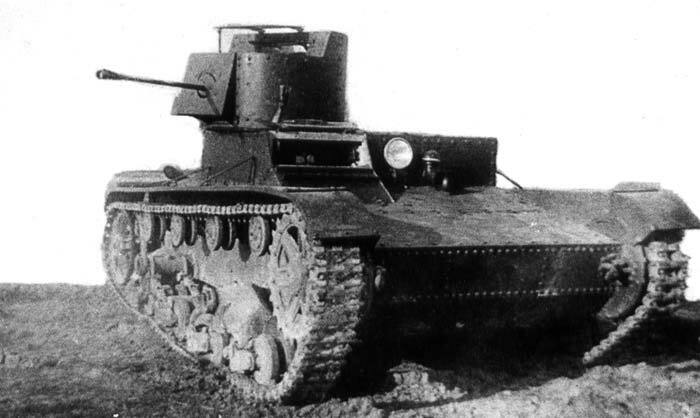 When the T-26 Model 1933 was introduced, Factory 174 immediately started to explore new avenues on converting the tanks into chemical warfare tanks. 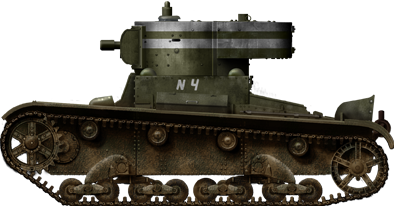 A prototype T-26 Model 1933 was taken, its 45 mm (1.77 in) gun was removed and a KS-25 flamethrower was installed in its place in the mantlet, which itself was redesigned. A HT-130’s turret mantlet. Notice the KS-25 flamethrower on the left hand of the mantlet, and a ball mounted DT-29 machine gun on the right. Also notice the armored caps for the refueling of the main weapon on the left hand of the tank’s hull. On the left-hand side of the tank, two canisters with a combined capacity of 360L were situated, with a mixture of kerosene and oil, with two armored caps on the hull roof for refueling. The maximum range of this flame unit was reduced to 25 m. However, 40 shots could be fired in 5-second bursts. A combat photograph of a HT-130 discharging a wall of flame. This is likely a propaganda photograph, and not likely to be a picture of a HT-130 in combat. HT-130 production began in 1936 and ended in 1939 after 401 units were manufactured. 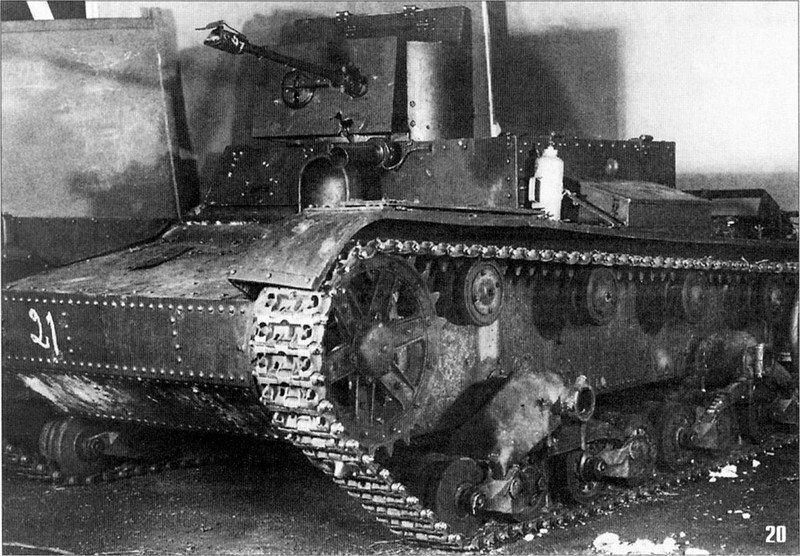 Radio controlled versions of these tanks were experimentally tested during the late 1930s that culminated in live fire trials of radio controlled HT-130 tanks engaging Finnish forces during the Winter War. At least one example of a standard T-26 upgraded to HT-130 standard exists. The tank in question was a Model 1935 with softer edges on the gun mantlet. 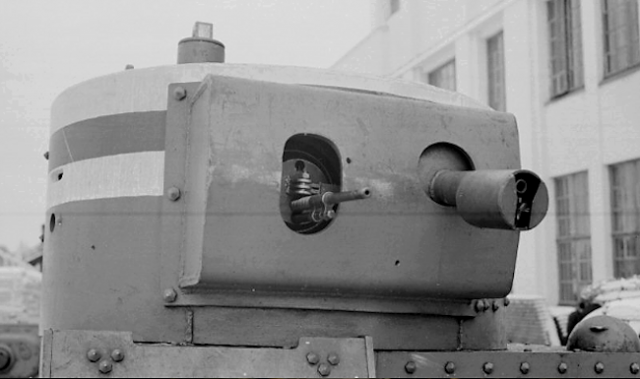 The tank evidently was used in the radio controlled experiments, as it has two radio ports in the turret. The 45 mm gun was removed from the turret, leaving just the external gun sleeve. In its place, a KS-24 from an HT-26 was placed in the turret. This tank was lost in Ukraine along with other radio controlled tanks. The T-26 in the foreground had, in fact, been upgraded to the HT-130 standard by removing the 45 mm gun and putting the KS-24 flamethrower in its place. Notice that all of these tanks have two radio antenna ports for radio controlled tanks. These tanks are a mixture of HT-130s and T-26s. The HT-130 was manufactured from 1936 to 1939, however, as with the last T-26 upgrade, avenues into modernizing the chemical tanks were explored. 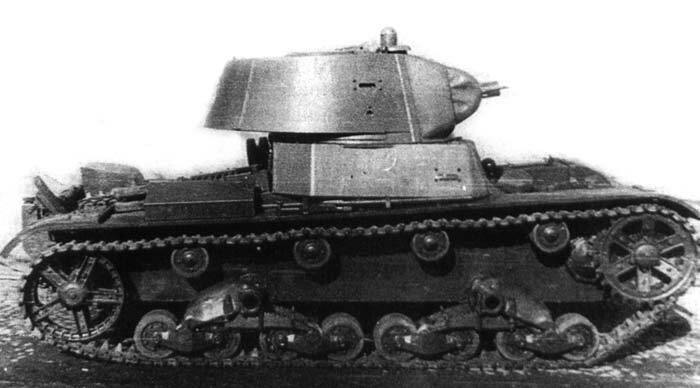 The implementation of the T-26 Model 1939 gave Soviet engineers a new hull and turret to work with. Therefore, two experimental tanks were designed, namely the HT-131 and HT-132. The HT-131 appeared in the beginning of 1939. This tank retained the new 20 mm (0.79 in) hull plates of the Model 1939 T-26, along with a turret with a 45 mm gun. The KH-25 flamethrower was installed in the mantlet, next to the 45 mm gun. The combat effectiveness of this new machine was impressive, however, it was found that the turret was too cramped, and the crew had too many jobs inside the turret to cope properly. The HT-132 was an improved version of the HT-131, in which the 45 mm gun was removed. The KS-25 flamethrower was installed in the mantlet with a coaxial DT-29. The HT-132 was tested in the autumn of 1939 and was accepted for production, with some minor alterations, as the HT-133. A HT-133. Notice that unlike a regular production T-26, the turret is on the right side of the hull, and on the left, two armored refueling caps are situated. Despite being structurally similar to a regular T-26 Model 1939, production of the HT-133 was very slow. This was actually due to the many small changes to the turret, that meant that a standard T-26 turret could not be used, and fresh turrets had to be manufactured. By January 1940, these teething problems were ironed out, and full production commenced. The last tank left Factory 174 in the second quarter of 1941, just in time to see action in the war with Germany. By this time, an additional 265 HT-133s had been manufactured. Factory 174 then commenced production of the new T-50 tank. The HT-134 was a private venture from Factory 174 to design a flame-throwing T-26 that still retained the 45 mm gun. The designers placed the flame nozzle in the hull, next to the driver. The turret was still on the right side with the flame fuel in the left. Two prototypes were manufactured. Before the HT-134 tanks were sent to the Finnish front, they were up-armored using bolted armor plates of 10 mm (0.39 in) thickness. This increased the thickness of the turret and hull armor to 30 mm (1.18 in), allowing for some much-needed protection against the Finnish 37 mm (1.46 in) guns. An HT-134 before being sent to the Finnish front. Notice the bolted armor on the turret to give the tank some much-needed protection. The first use in action of the chemical T-26 tanks was during the bloody war with Japan in Manchuria and Khalkhin Gol. 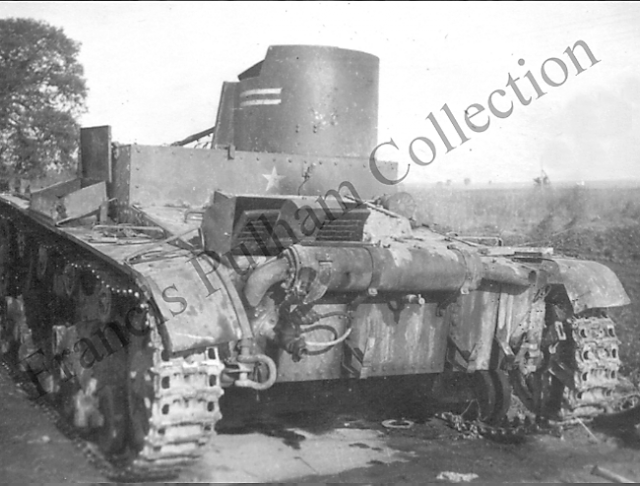 Just before the conflict, there were only 10 HT-26s attached with the 11th Tank Battalion of the 57th Special Corps. However, this number was increased to 18 just prior to the start of the conflict. The often disastrous supply of ammunition was also a worry, as each tank only had enough spare fuel for 7 refills. Interestingly, the HT-26 tanks are recorded to have been highly effectively in the opening engagements with Japanese troops. On the 27th and 28th of May 1939, “ognemёtnye” (flamethrower) tanks attacked and successfully defeated troops under the command of Colonel Yamagata. Later, HT-26 tanks engaged a reconnaissance battalion numbering 220 men under Lieutenant Colonel Azuma, which were “successfully dealt with”. However, a week later, the situation changed drastically. The Japanese penetrated the rear of the Soviet positions, and a large number of Soviet men and machines were lost. The largest battle took place at mount Bain-Cagan. This started poorly for the Red Army, as the Japanese were attempting to cross the Khalkhin-Gol river. Therefore, the 2nd battalion of the 11th Tank Battalion was ordered to engage the enemy. 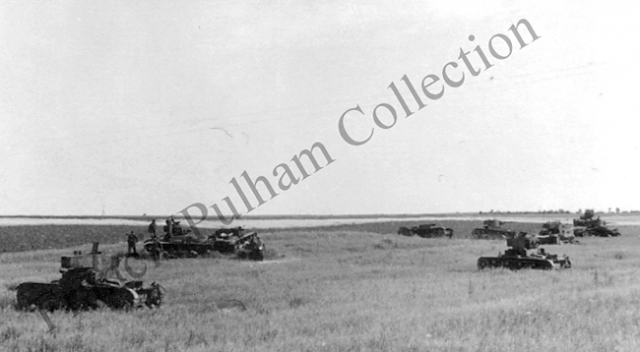 The battle took place on July 5th and involved 15 BT-7s and 5 HT-26. This disastrous attack on the Japanese 70th Infantry Regiment resulted in the complete destruction of every Soviet vehicle, as these tanks had no infantry support and were under direct heavy artillery fire. 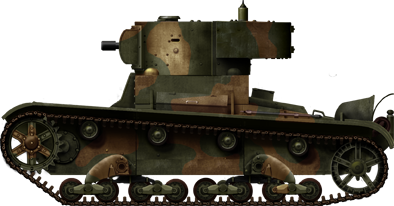 Japanese soldiers had such a dislike for these tanks, that they often proved to be more useful as a morale weapon more than a flame-throwing tank. 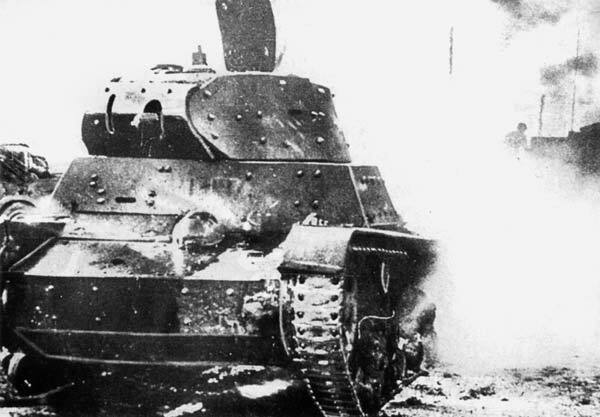 Reports of Japanese soldiers fleeing when an HT-26 approached is a testament to the fear that these tanks produced. However, due to this fierce dislike of the tanks, crews were often very poorly treated and often killed on the spot. The good performance of the HT-26 tanks is a testament to the primal fear of fire, and how chemical weapon tanks could be successfully fielded. This was not always the case, as with the battle on July 5th that cost the Red Army 5 valuable vehicles. In total, 10 of the 18 HT-26 tanks were lost in the fighting. During the Winter War from the 30th November 1939 to March 13th 1940, 5 Special Chemical Battalions were organized to field exclusively flame throwing T-26 tanks. 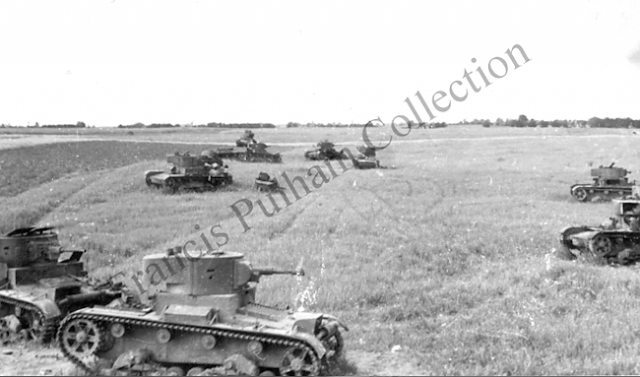 These brigades were in the 30th and 36th Tank Brigades and were the 201st, 204th, 210th, 217th and 218th Tank Battalions. A HT-26 in Finland, captured by Finnish forces. It was this very reason that returning HT-133 tanks were upgraded with bolted armor to attempt to stop this issue. It was found that many tanks were also lost up to 100 m (110 yds) from the Finnish lines, which meant that they were totally ineffective. It was for this reason that factory 174 explored the HT-134. During the conflict, 208 HT-26 and HT-130 tanks were fielded, and 165 HT-133 tanks were delivered from the Leningrad-based Factory 174. In addition, 70 HT-26 and HT-130 tanks were sent to the front, with a total number of 446 tanks fielded during the conflict. Of these, 124 tanks were knocked out, with 24 totally destroyed. Of these 59 vehicles were repaired, and 69 were removed from the battlefield. It was during this conflict that radio controlled HT-130 tanks were experimentally fielded and used to attack Finnish forces. 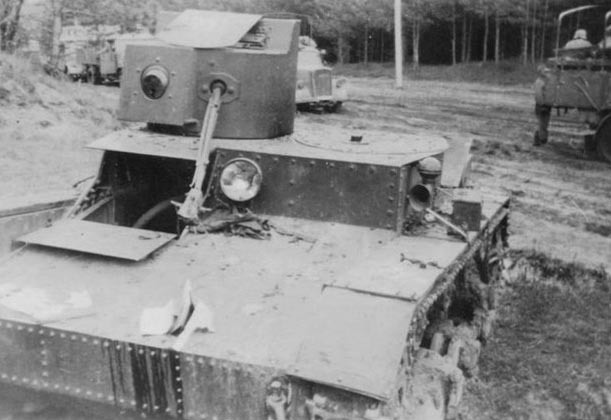 These tanks had a large and complex radio-controlled driving system, with two radio antenna ports in the roof. These were driven by a T-26 command tank that had no turret, and a large complex driving system. Unfortunately, the trials were unsuccessful. 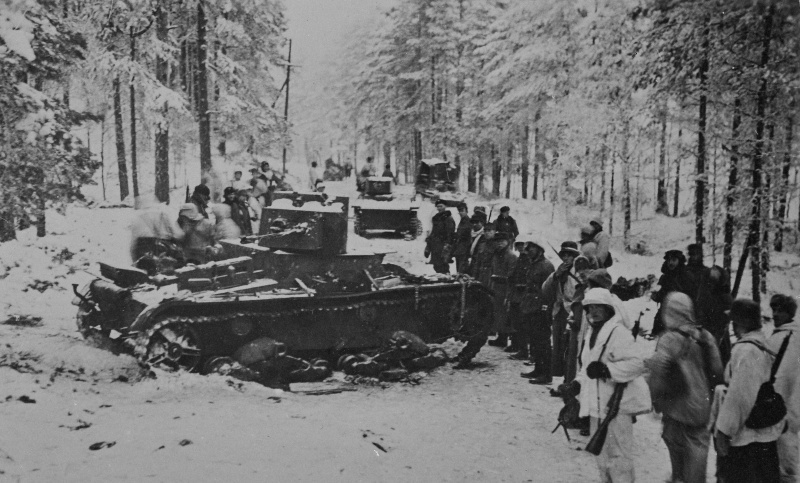 During the Winter War with Finland, Russian forces increasingly found that their standard light tanks had armor that could be penetrated by any of the Finnish AT weapons. Therefore, early on into the conflict, it was decided to return a number of HT-133 tanks to the factory of origin (174 in Leningrad), to have bolted armor plates added onto the hulls and turrets of the tanks. These plates were 10 mm (0.39 in) thick and increased the thickness of the armor on the tanks to 30 mm. This was still not adequate to stop guns higher than 37 mm, however, against the Finnish guns, they were effective. An HT-133 that had been screened. This tank was lost in early September 1941. It is unknown how many tanks were converted to this standard, however, it is known that both HT-133 and T-26 Model 1939 tanks were equipped with these plates. It should be noted that these tanks were NOT known as T-26Eh, as the term Ehkranami is actually a post-war name for tanks equipped with plates. In wartime Soviet documents, the tanks were listed as “T-26 with shields”, “T-26 screened” or “T-26 with plates”. 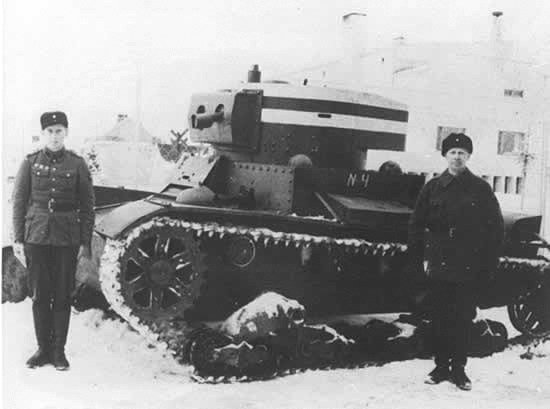 A HT-26 of the 210th Separate Chemical Tank Battalion, Karelian Isthmus, January 1940. The tactical unit number is on the rear part of the turret. 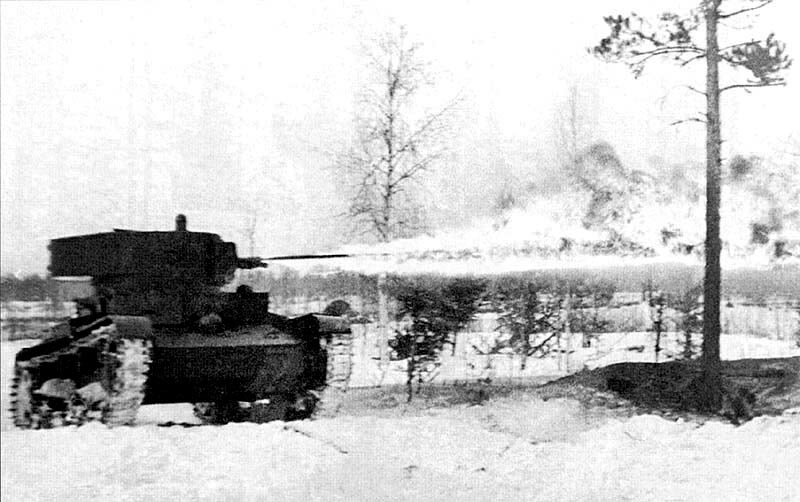 A TT-26 remote controlled, radio guided version of the HT-130 flame-thrower belonging to the 217th Separate Chemical Tank battalion, northern sector, Finland, January 1940. HT-133, flame-thrower version of the T-26 model 1939. 37th Army independent Chemical Battalion, Kiev, September, 1941. During the year between the end of the Winter War and the beginning of WWII, the Red Army began to undergo a major reorganization of its tank regiments. One of the greatest missteps was deciding to include flame-throwing tanks in the divisions with normal tanks. This not only complicated the logistics of maintaining the tanks, but the tanks were then deployed ineffectively in small packets. This poor decision led to the major loss of all of the chemical tanks early in the war; tanks were poorly deployed when attacking German soldiers, and more often than not, broke down before engaging the Germans. Three HT-133s lost in 1941. The turret markings indicate deployment in the Leningrad Military District. A good example is the three HT-26 tanks that were deployed in the 68th Tank Regiment alongside T-35 heavy tanks. 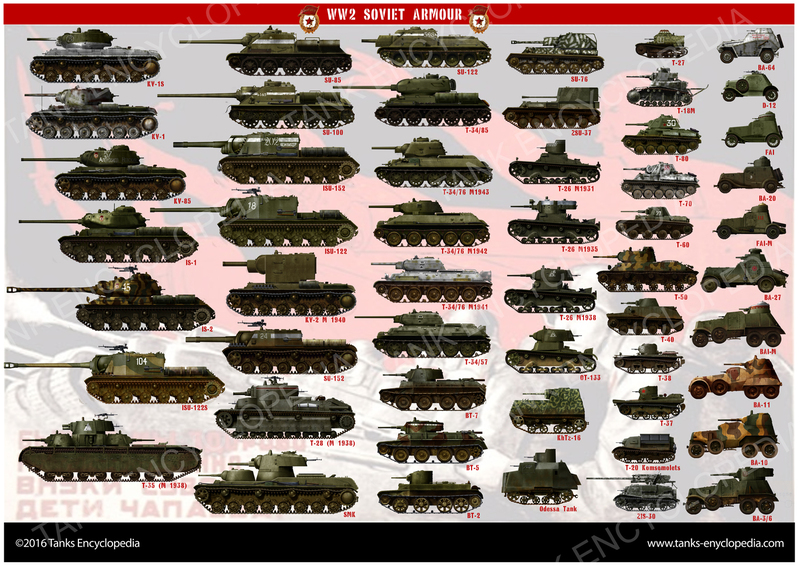 The regiment had to support no less than four types of tanks: T-35s, T-26s, BT-7s and HT-26s. Each vehicle required different fuels, ammunition, spares and recovery vehicles. During the panicked retreat from their bases east of Lvov, the vast majority of the tanks was lost due to breakdown. 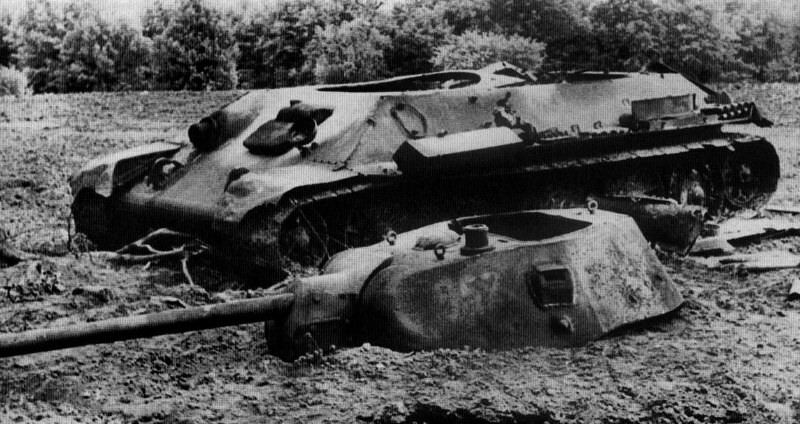 The three HT-26 tanks have been identified, two of which broke down, and the third showing signs of damage to the turret. These flamethrowing tanks would survive until 1944 fighting the German forces on the Eastern Front, however, the last HT-26 tanks were used in 1942. 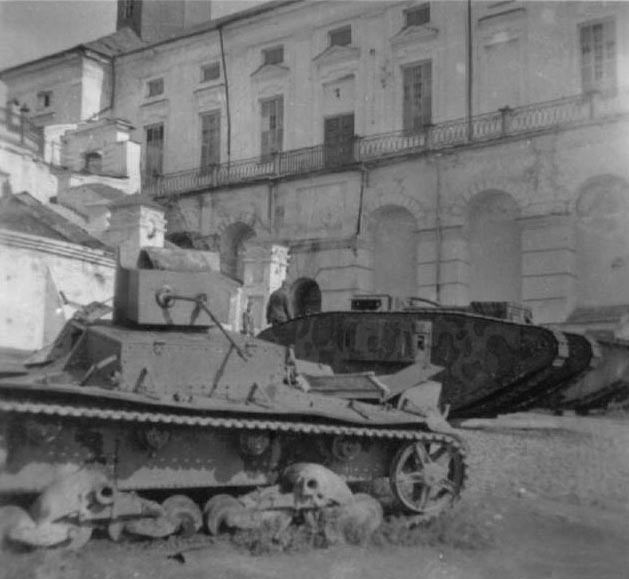 The surviving HT-130 and 133 tanks were deployed in the Leningrad Military District and were used in the defense of Leningrad between 1941 and 1944. The flame-throwing tank idea was one that was very popular, and even though the tanks were vulnerable, the physiological effect of these weapons was undisputed. It was a fact that flame throwing weapons were highly effective against dug-in infantry targets, and were able to clear out hard points like no other weapon could do. Therefore, during the early stages of the war, experiments were conducted with flame throwing tanks. 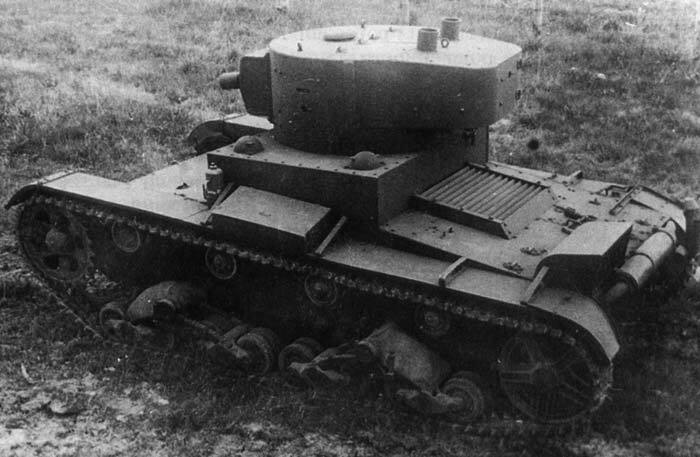 The first attempt at a modern flame-throwing tank was the OKV-1, often misnamed as the KV-6. The tank does not have an official name, as only four prototype tanks were made sometime in September before the design was rejected. These tanks had a flame unit in the hull next to the driver. Each of the four prototypes was a different design, with slightly different flame units. Each one was fitted with the KS-25. All were fielded, and all were captured by the Germans. Two were in fact, pressed into German service! One of the OKV-1s that was lost. Notice the distinct flame unit in the hull. 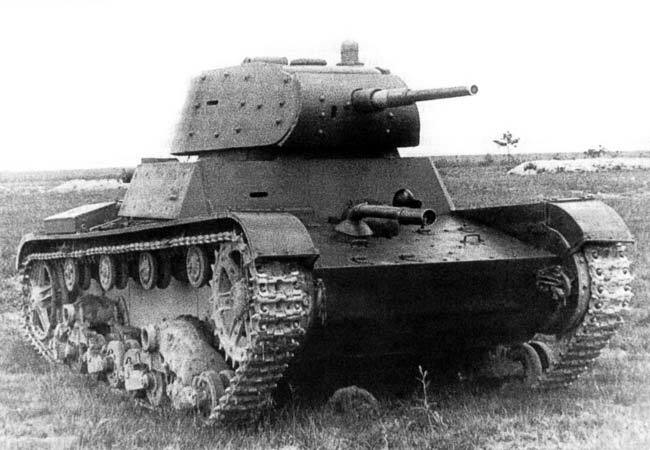 Next, OT-34 tanks were manufactured, with some of the earliest known examples being STZ (Stalingrad) manufactured tanks. 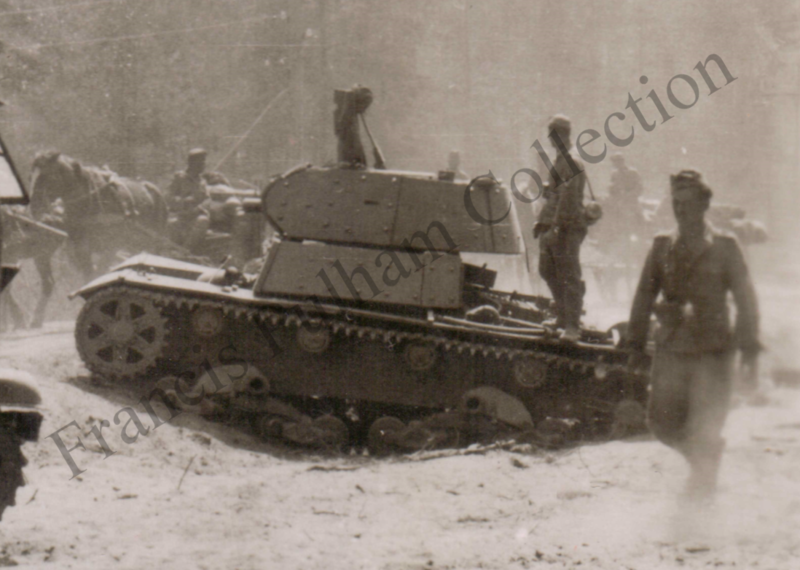 However, UTZ (Uralmarch 183) tanks and Krasone Sormovo (112) tanks were also made. These were fielded very successfully up until 1945. This design also featured the KS-25 flame unit, this time on the hull gunner’s position. An OT-34 manufactured at STZ in the spring of 1942. Notice the ball mount houses a KS-25 flame unit. The most famous flamethrower KV tank was the KV-8. This replaced the 76.2 mm (3 in) ZiS-5 gun with a 45 mm Model 1942 gun, with a coaxial KS-25 flamethrower. These were manufactured in early 1942 and were moderately successful. The 45 mm gun was housed in a fake barrel to fool German gunners that the tank was equipped with a 76 mm gun. Arguably, these were the most famous flame-throwing tanks in the Red Army, even if they were produced in the smallest numbers. 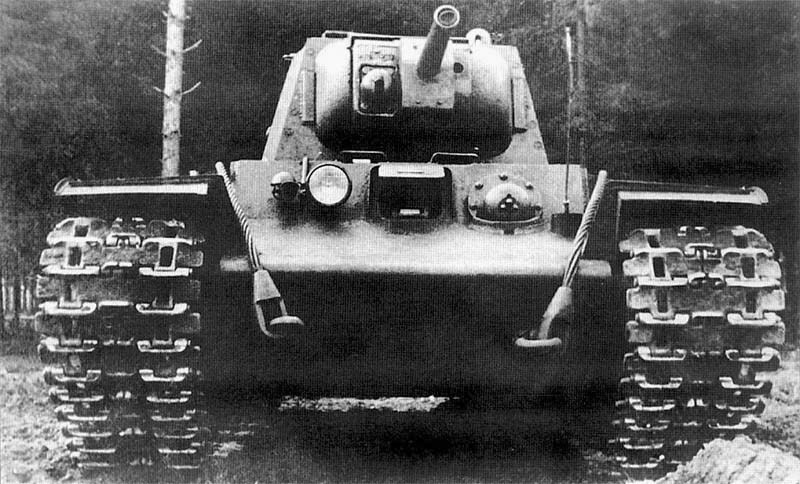 A front view of the KV-8. Notice that the only difference between this tank and a standard tank is the gun mantlet. 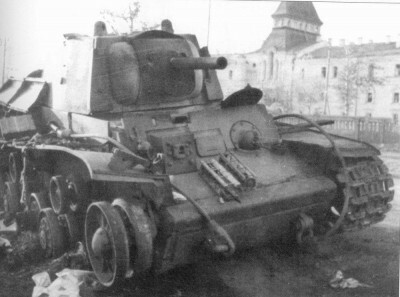 This HT-26 was employed with the 68th Tank Regiment and was deployed in the Lvov Oblast in June 1941. Notice the “=” mark on the turret that was far more common on the T-35s that served in the 68th Tank Regiment. A red star had been painted onto the rear of the upper hull. Notice the combat refueling system under the exhaust. This HT-26 was captured by the Finnish army in 1940, with this picture taken from the repair center established for the renovation of Soviet vehicles. An HT-26 at Smolensk in 1941. An HT-130 during trials during the late 1930s. The tank is equipped with two radio antennas, indicating it was in fact radio controlled. The same HT-130 as above. This view from above now clearly displays the two turret mounted antennas for the radio control system. 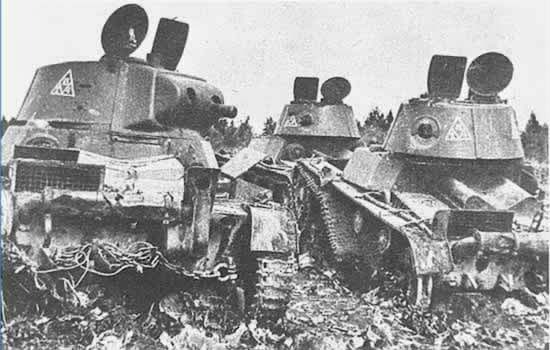 These tanks were used in Finland in 1940, and de-equipped tanks with crews were used and lost in Ukraine in 1941. An HT-130 that had been captured by Finnish forces and pressed into Finish army service. Radio controlled HT-130s lost in Ukraine in July 1941. Notice the tank in the foreground on the left has two turret mounted radio hard points. Almost all of these tanks were equipped with two radio antennas. The HT-133 used the hull and turret of a standard T-26 Model 1939. Notice that the turret is on the right hand side of the hull, whereas the standard production tanks had the turrets on the left side. With obvious shielding, this HT-133 sits abandoned in 1941. Notice the extent of the plating, covering the entire tank. 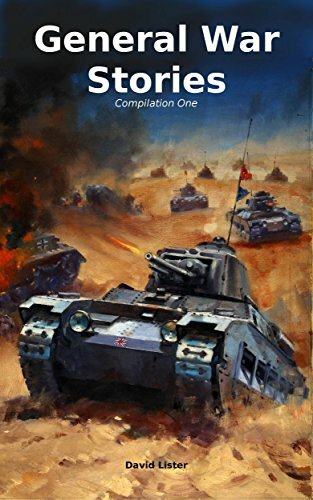 A compilation of little known military history from the 20th century. Including tales of dashing heroes, astounding feats of valour, sheer outrageous luck and the experiences of the average soldier. Is there any more information about the Smolensk, 1941 photograph with Mk. IV tanks in the background? An excellent article, by the way. Thanks! As far as i am aware, most Mark V tanks were display pieces to remember the Russian civil war, however a few examples have 45mm guns in them. As for these particular vehicles, i am not sure. Majority of Mk.V tanks used by the Red Army were Hermaphrodites. It is not too hard to find out which ones by comparing the SN of those tanks. However, they were never converted to carry 45-mm guns as Mk.V were taken out of service in 1930-31 while the 45-mm gun 20-K was not accepted into production until 1932. The only tanks re-armed with 45-mm were the ones captured from Estonia in 1940. Will you ever add the T95/T28 Super Heavy Tank? It has been in the works for a while now.